Flynn Nagel sprints into the end zone. The senior receiver had 220 receiving yards in Northwestern's stirring victory over Nebraska. 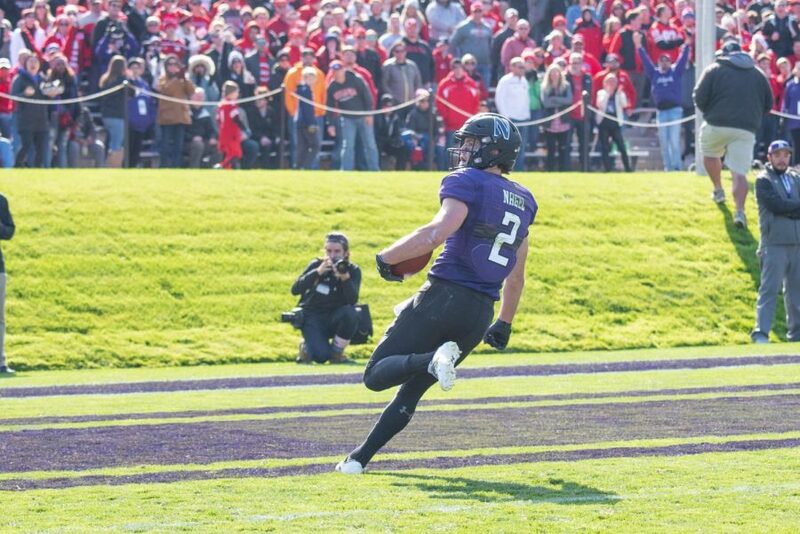 Flynn Nagel turned to his teammates on the Northwestern sidelines, not far from the scoreboard that showed Nebraska leading 31-24 with two minutes to play. The senior receiver had a message for all of them. “He was just saying, ‘We’re going to win this game. We’re going to win this game. You’ve got to believe it,’’ senior quarterback Clayton Thorson relayed. Nagel turned out to be right. Over the next half-hour, a remarkable 99-yard touchdown drive to tie the game with 12 seconds to go, an interception from sophomore safety J.R. Pace on the Cornhuskers’ overtime possession and the second career field goal by backup kicker Drew Luckenbaugh lifted the Wildcats to an improbable 34-31 overtime win on Homecoming. Nagel, a senior receiver, tied or set new career highs across the board with 12 receptions for 220 yards — the most by any Big Ten receiver since 2013 — and two touchdowns, and Thorson did the same with 41 completions for 455 yards, as NU (3-3, 3-1 Big Ten) dealt Nebraska (0-6, 0-4) a most painful loss at Ryan Field on Saturday. The Cornhuskers, trailing 14-13 at halftime, surged in the second half to take a two-score lead and had all but put the game to bed after backing the Cats into a fourth-and-10 deep in their own territory with barely five minutes left and a 10-point deficit. But Thorson kept NU alive with a completion, and the hosts drove close enough for Luckenbaugh to drill a 31-yard field goal, the first of his career, to cut into the deficit with 2:27 left. The Cats’ defense, gorged all day long until that point by Nebraska running back Devine Ozigbo (159 yards, two touchdowns), then came up with three crucial stops to get the offense one more chance. Thorson hit Nagel on three straight plays to move in to Cornhusker territory, connected with junior receiver Ben Skowronek to move down to the 5-yard line and then found freshman JJ Jefferson diving into the end zone to send the purple portion of the sold-out crowd of 47,330 into delirium. Once overtime started, NU — now 4-0 in games tied after 60 minutes over the past two seasons, including one last autumn in Lincoln — seemed destined for another wild victory, and this time, it was destiny that delivered. Not everything was rosy for the Cats, beyond the fact it took an against-all-odds rally to beat a winless team at home. The running game, for example, again struggled mightily: NU averaged 2.1 yards per rush attempt and finished below 40 total rushing yards for the third straight game, plus leading runner John Moten departed mid-game with an injury. Still, the Cats successfully rode their clicking aerial attack to exhaustion — Thorson attempted 64 passes — to slightly out-gain the Cornhuskers, 487 yards to 482, and get back to .500 on the season entering a should-win matchup at lowly Rutgers next weekend.